Crisp roasted kale, protein-packed black beans, smooth & creamy goat cheese, and spicy Sriracha make this ROASTED KALE WITH BLACK BEANS, GOAT CHEESE & SRIRACHA the perfect, simple. healthy and fast meal for any day of the week. So I never actually intended to share this recipe with anyone. My husband and I are budgeting to save up for our trip to Italy next summer, so I was just trying to make some simple, healthy meals and use up some of the stuff that gets ignored in our pantry. I bought a big bag of kale from TJ’s and figured It could last me at least a few days….Okay, so like 3. I eat a ton of vegetables, and just a lot of food in general. 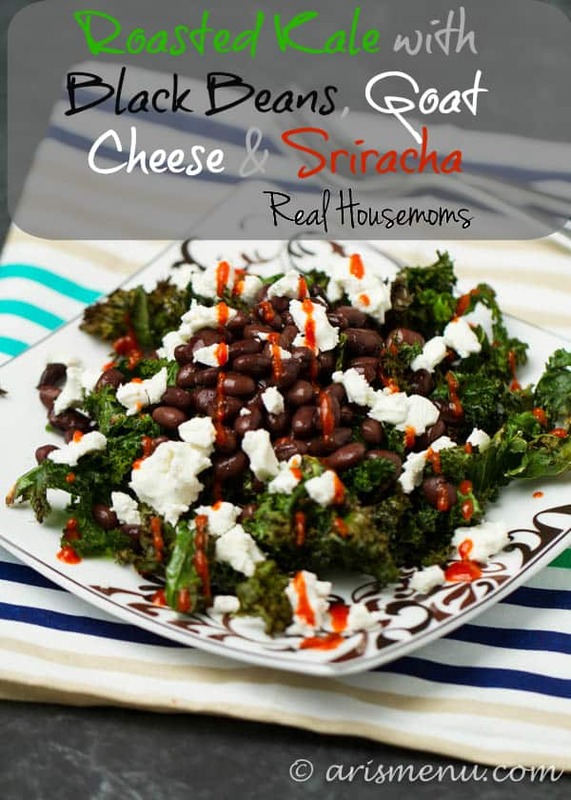 I just looked around my pantry one day, roasted the kale, decided to throw in some canned black beans that had been hanging around for a long time because I always buy black beans and then get home and realize I already had 6 cans… Well, then, obviously, goat cheese and Sriracha go on everything. One thing you will learn about me is that I am totally obsessed with goat cheese, sweet potatoes and cilantro. They are my favorite things. Also, I put Sriracha on just about everything because I also love spicy food. You don’t have to though, if you don’t. I won’t judge you. Promise. Like I said, this was so random and simple, I never expected I would end up blogging about it, but by the third day in a row I ended up making it for lunch, I decided maybe you guys would love it just as much. And I’m pretty sure you will. Also, you can toss a fried egg on top and call it “breakfast”. Or toss a fried egg on top and call it ALL OF THE MEALS because a drippy yolk is also one of those things that makes everything better. Either way, you will love the simplicity of this dish + all of the bold flavor, and you definitely will forget that you are eating a healthy blogging cliche! 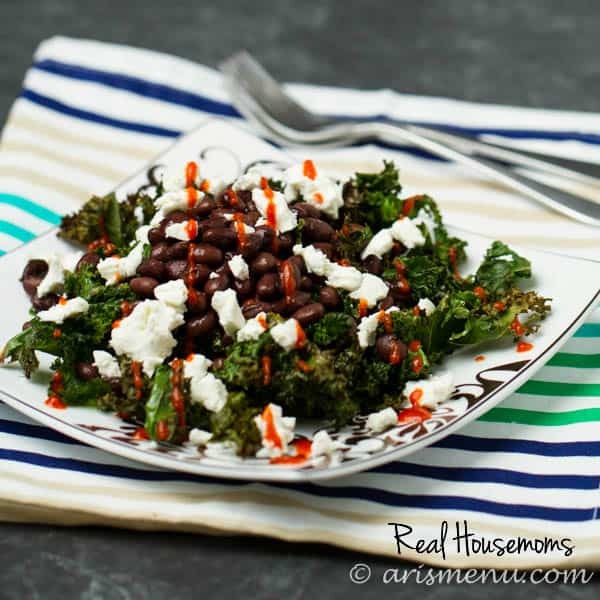 Crisp roasted kale, protein-packed black beans, smooth & creamy goat cheese, and spicy Sriracha make this the perfect, simple. healthy and fast meal for any day of the week. Preheat oven to 400. 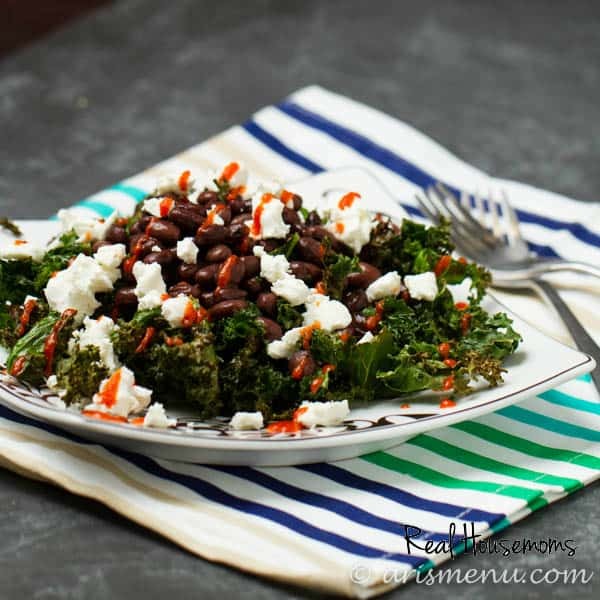 Toss kale with olive oil and seasonings. Place in an 8-9" square roasted pan (or 9x11, or 9x13) and bake until crispy, about 15-20 minutes, tossing half way through. 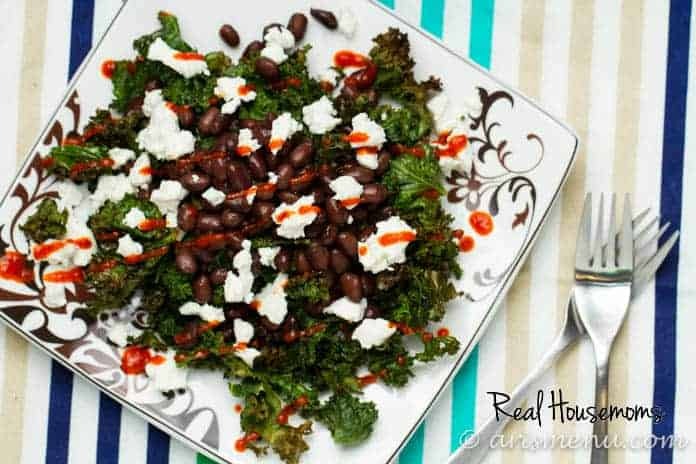 Top with black beans and goat cheese. Drizzle with Sriracha and serve immediately. This recipe is easily doubled, tripled, etc. to serve more than one person.